Join us for this year’s Black History Month Exhibition entitled, Motivation by Inspiration: A Black History Month Exploration. This year’s collection features African American visual artists from Maryland, Washington D.C., Virginia, and Kentucky. A diverse group of themes is explored as we travel through conflict, migration, identity, and expression. As we move through themes of pain, we push towards triumph. 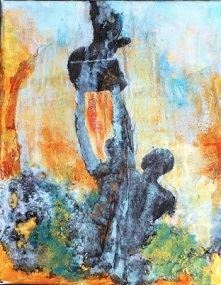 Each artist finds inspiration through their own exploration of the African American perspective.